Irvington Middle School students and their French teacher Deanna Tessler recently received a letter and picture from the students of Eliane Clarke Elementary School which is located on the island of St. Martin, thanking them for their generosity. The students – who are members of the French Club at the middle school under Tessler’s guidance – donated a variety of school supplies to the elementary school that was severely impacted by Hurricane Irma. The students raised a total of $3,000 and decided to donate $600 to the Houston Independent School District for Hurricane Harvey relief, $600 to the Hispanic Federation’s Unidos: Disaster Relief and Recovery for Puerto Rico and $600 to the United Way of Miami-Dade for Hurricane Irma relief. With the remaining funds, they purchased books, paper, scissors, crayons, pencils and markers for the Eliane Clarke Elementary School, as well as classroom posters, pencils, paper and beginning readers books for the St. Martin Primary School on the island of Dominica, and shipped the items to each school. Tessler said this was the 15th year that Irvington Middle School has celebrated French Week. As a way to honor the students’ efforts at the start of the new school year, she will share the picture and thank-you letter that she received from the group of students in St. Martin. 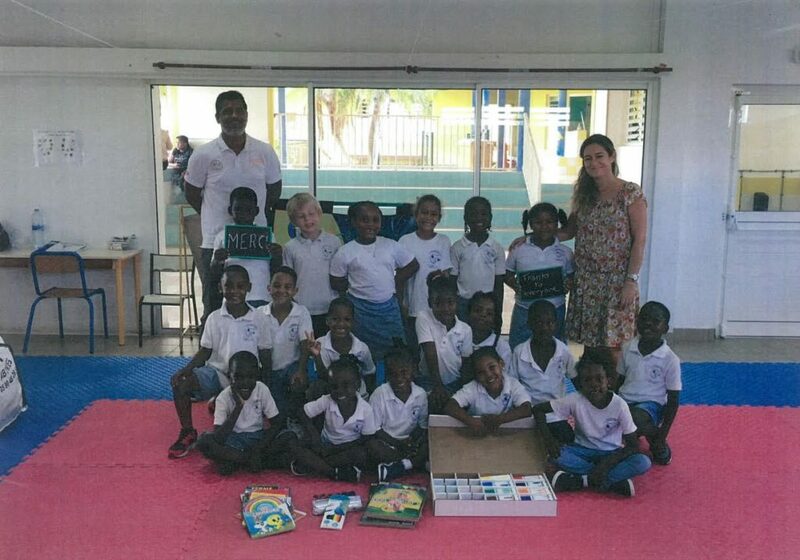 Photo Caption: Students from the Eliane Clarke Elementary School, which is located on the island of St. Martin, are pictured with the school supplies that Irvington Middle School students and teacher Deanna Tessler donated to them.